Well, I finished my second full week of pastry school. I can’t truthfully say it was the best week ever – mostly because I got dreadfully sick and spent the week fighting a fever and trying to keep my lungs from being coughed out of my chest, but there were some pastry-related incidents as well. 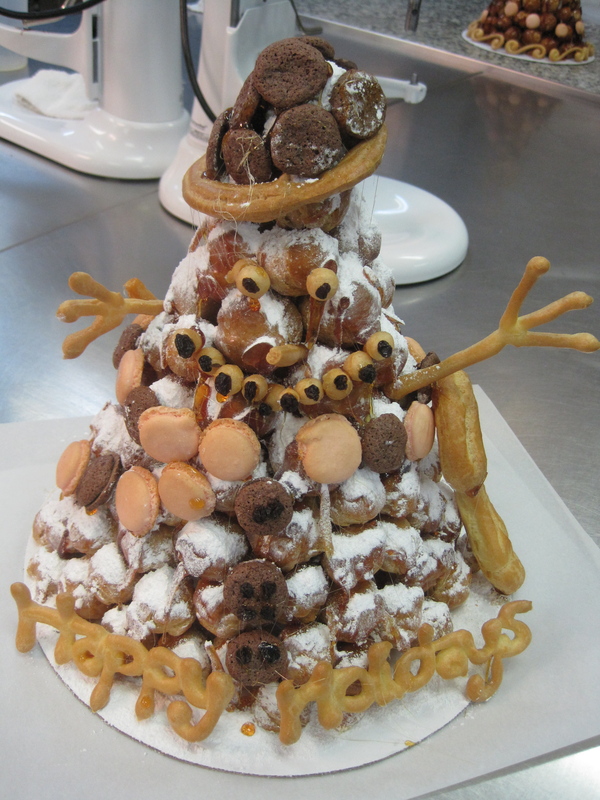 it ended up looking like someone threw up all over a perfectly good croquembouche. Ah well. No one said this pastry thing was going to be a cake walk. I mean, we haven’t even gotten to cakes yet. I’ll keep you posted. For now, I’ll just stick with cookies. Preheat the oven to 350 degrees. Toast the 170 grams of pecans in the oven or in a dry pan until lightly browned. Cool completely. Pulse the nuts in a food processor, until they’re the size of coarse cornmeal. In a mixer fitted with a paddle attachment, cream the butter and sugar until light and fluffy. Add the ground nuts, egg yolk, salt, scrapings from the vanilla bean, and bourbon, and mix until thoroughly combined. Add the flour, and mix gently until just incorporated. Shape the dough into a log approximately 2.5 inches thick. Roll the log up in a sheet of parchment paper and chill in the refrigerator, about 30 minutes. Once chilled, slice the log into 1/4-inch thick slices, and place the sliced cookies on a parchment-lined cookie sheet. 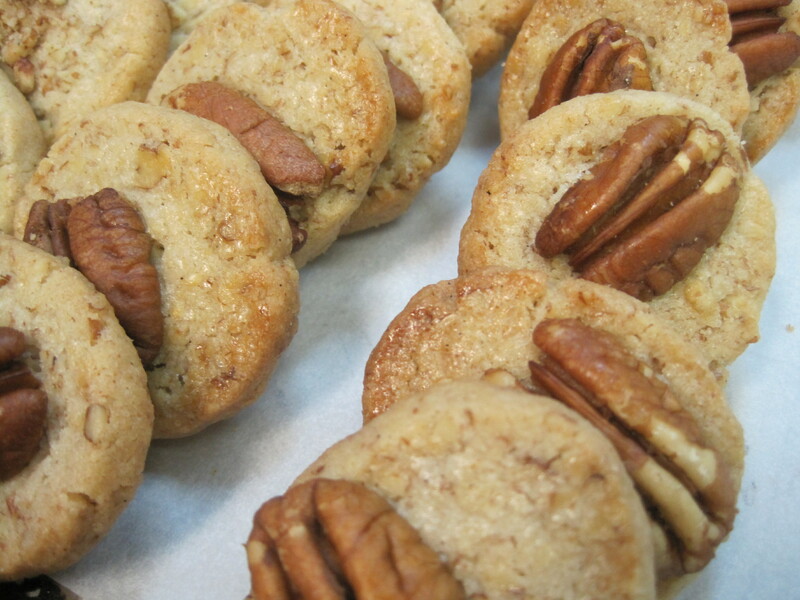 Lightly brush the tops of the cookies with egg wash, and place a pecan half (or some crumbled pecan pieces) on top of each cookie. Bake the cookies for 7 to 10 minutes, or until nicely browned on the edges. 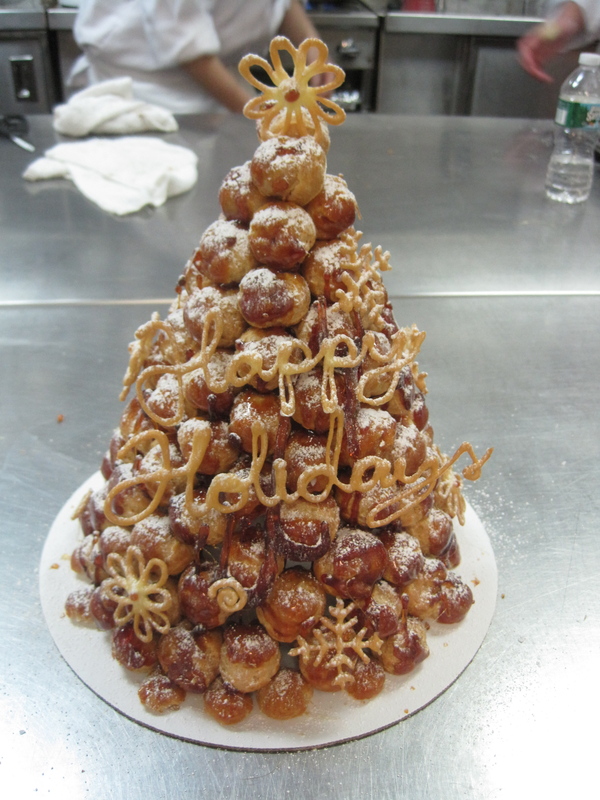 I think that Croquembouche and Schoochie would be good pals. Really. I would like to make this amazing recipe but I need a bit of help. Bourbon is the whiskey or vanilla? Hi Shaza! I mean bourbon whiskey, yes. Although if you want to skip the bourbon, you certainly can substitute vanilla extract instead.